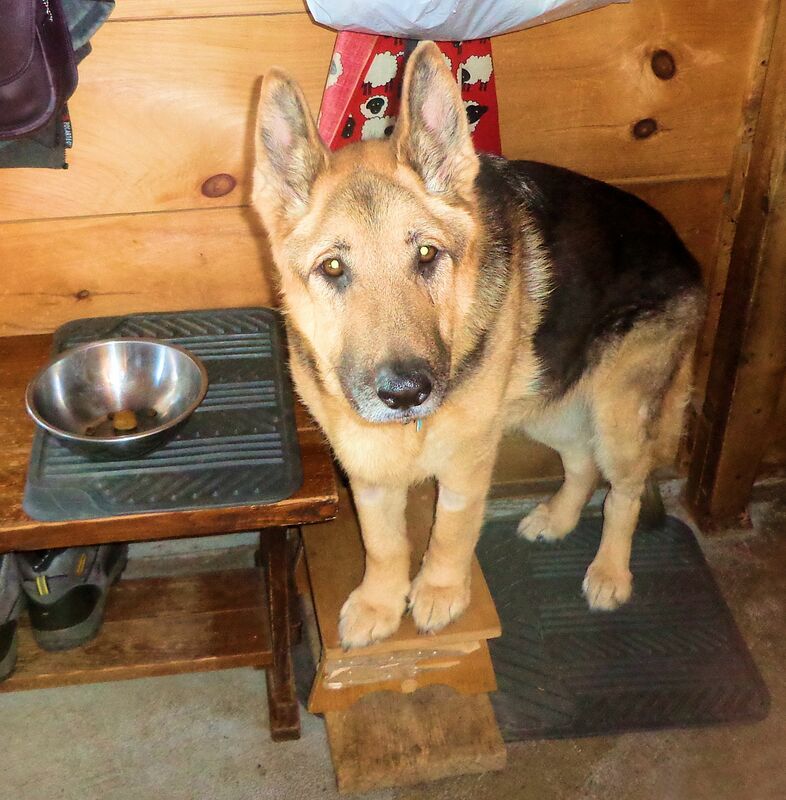 Here is Holly, our 7-year-old German Shepherd, on her special stool for eating. She must stand with the front of her body elevated to about a 45 degree angle while she is eating and for about twenty minutes after to help her food go down. She has megaesophagus. The muscles of the esophagus have relaxed and don’t swallow properly. Food builds up inside her throat, swelling up her esophagus instead of going into her stomach. This leads to regurgitation of undigested food and can cause inhalation pneumonia. She has had this problem for several months. At first we thought it was caused by Lyme disease. She was diagnosed with that illness in the fall. Since then she’s undergone two 30-day courses of antibiotics. Her symptoms improved about fifty percent from when she was the most ill. Then she hit a plateau. Last week we went back to the vet for more testing. The vet had to shave spots on both front legs to get the blood necessary to run a full panel. The results came back essentially normal. We were all scratching our heads over this dog. She had low normal thyroid function. Her energy levels have been low and her coat is poor, although she is underweight and has muscle wasting which could explain those symptoms. Or the symptoms could be due to low thyroid function. We decided to start her on thyroid supplement for a month to see if it made a difference. The twice-a-day dose is not too much trouble because the pill is tiny and goes down easily. We have noticed that she seems a bit brighter and more energetic the past few days. The megaesophagus has not really changed. I have been doing considerable research trying to figure out what is wrong with Holly. There is a small amount of information about low thyroid dogs and concurrent megaesophagus in the medical literature. In general, this condition is unusual, but not unheard of. German Shepherds are one breed more often affected. In most cases supplementing thyroid hormone does not affect the megaesophagus. In a few cases, the regurgitation of undigested food held in the throat disappeared after the thyroid levels were improved, although radiologic evidence of megaesophagus remained. In one cited case of a seven-yr-old female German Shepherd, not only did her overall condition improve on the medication, but the megaesophagus resolved. So there is some hope that things might improve for Holly. She does a very good job of climbing up on her stool for meals and standing there until she is told ok to get down. Most of the time she eats all her food, it goes in and stays in. Sometimes we have a mess to clean up. The fact that she seems in better spirits is heartening. Sure hoping that Holly’s case follows a successful path. ***On Feb. 18, 2017 Holly lost her struggle with whatever illness was debilitating her. She passed peacefully and in the spring will be laid to rest in the cemetery with our other dearly departed pet friends.